Matt Owensby conducts last year. Presenting your Valley Center Symphony: Left to right, front row (strings): Diane Wynn, Rowena Pasamonte, Susan Barber, Shayna Barber, Susan Padilla, Carl Mellor. Second row (woodwinds left to right): Sydney Park, Riley McCarrick, Ed Labrado, Karen Rockwell, Donanne Cummings, Jonathan Pasamonte, Miyuki Watanabi (piano), Leo McNamara. Back row left to right(brass and percussion), Mason Hock, Linda McNamara, Keith Larson, Bradley Pettit, Matthew Owensby (conductor). Somewhere between surprising and unique, the small-town, all-volunteer Valley Center symphony orchestra seems to strike the right note. A culturally uplifting — shhh… — community secret, the local concoction of musicians ranging from first-time practitioners to seasoned professionals seems as dedicated as it is diverse. “Few communities can say that they have their own orchestra,” said Ed Labrado, a master of understatement as well as oboe and clarinet. Labrado serves as symphony treasurer and spokesman, among other hats he wears. Membership is open to anyone, really, including high school students of which there are a few. It’s audition free. Symphonic players practice Sunday afternoons at Ridgeview church. New members are welcome, BYOI, or bring your own instrument. They play fairly often at special concerts either on the road or at home, the Valley Center Library community room. Best of all, all events are free. The current assemblage features a half-dozen violinists, viola, cello, a half-dozen woodwinds. four brass and one percussion. Add in a partridge and a pear tree and you’re ready for their annual Christmas concert. “We are a community orchestra whose objective is to provide an opportunity for the community to make and enjoy music,” Labrado said. “We have about 20 musicians including adults, retirees, college and high school students,” Labrado continued. 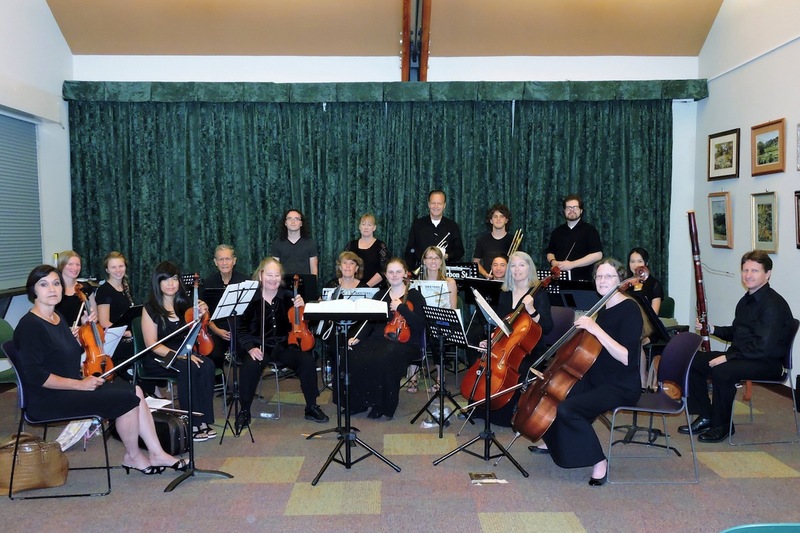 “We provide a variety of concerts for the community; for instance. Last April year we had an Oscars night concert featuring music from movies such as Jurassic Park. It’s a quirky bunch as well it should be. Similar to the Chicago Cubs rotating managers in the 1960s, the symphony features a slew of diverse conductors. It’s an interesting arrangement with conductors rotating depending on time and interest. Owensby is Padilla’s son, by the way and has been leading the way this summer as the group prepares to get on with its next show. Padilla characterized him as “patient,” a great attribute given the wide range of experience levels in the group. Bill Bonhivert conducted the group for a long time helping build skills while maintaining enthusiasm. The symphony presented a “Peter and the Wolf” concert series at the Valley Center Library as part of the “Read to the Rhythm” reading program on July 25. Next up for the plucky band of musicians is a not-so-scary turn presenting a Halloween Concert on Saturday, October 17 at Valley Center Library. This concert will be conducted by Cheryl Knapp, a retired Oceanside school district music teacher. Just as the symphony gives back eclectic and free, according to Labrado, they get a little help from their friends. It’s a 501(3)c non-profit dependent on donations to purchase orchestra supplies such as sheet music. The Rincon of Luiseno Indians, San Pasqual Band of Mission Indians, Friends of the Valley Center Library, Ridgeview Pre-school and Valley Center Lions.each help sponsor programs. Want to help get the show on the road in coming months and, hopefully years. If any musicians are interested in more information, call (760) 751- 4190 or email vcsymphony@gmail.com. The website is http://vcsymphony.weebly.com.